When moving abroad to live, work, study or retire, you will likely need documents apostilled or authenticated from the U.S. State Department. Atlanta Apostille helps individuals and businesses obtain federal certificates on documents for overseas use. Our team of professionals will guide you in obtaining proper certificates or stamps by reviewing that your document is in the appropriate format, attaching the correct affidavits, completing the right applications for registering your document, and submitting the document to the proper agencies for quick processing. Our service comes with the promise of dependability and confidentiality. We specialize in federal apostilles and authentications on documents from all 50 states, the U.S. federal government, and the Courts of District of Columbia for use in another country. Moreover, if you are sending a certified document for foreign use to a country which is not a member of the Hague Convention, you will need an additional legalization certificate from the country’s embassy or consulate. We are located near the U.S. Department of State and all the embassies in Washington, DC. This allows us to achieve the fastest turnaround time for an apostille or authentication certificate from the federal government and foreign consulates. We guarantee correct processing of documents and getting the job done right the first time. 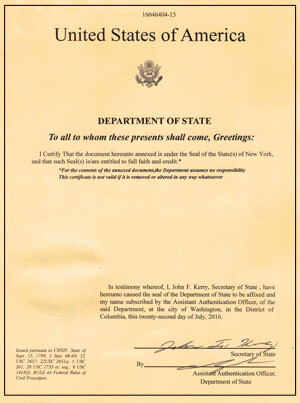 A federal apostille is required on certain state-issued documents or federal docuemts signed by a U.S. Federal Official, an American Consular Officer, a Military Notary, Judge Advocate (10 USC 1044a), or a foreign Consul diplomatic official registered with the State Department Office of Protocol. 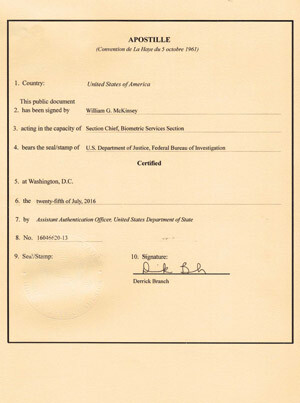 The following is a list of documents which we have authenticated regularly. This list is not exhaustive. If you don’t see your document on this list, please contact us. If you have any questions, feel free to contact us 24/7 or go to our order form to obtain your US DOS certificate today!